Lost track of which day we are on, I think 16 for Rob and I. Anyway onto important things, blue pants for me, Rob had two fried eggs on toast and I had a cheese and onion omelet. Today was down as a rest day, that meant no planned tours not an excuse to relax. Julie suffering with Delhi belly so Rob and J stayed in the hotel while Vic and I took the town & bazaar. Very interesting with spectacular views down the valley. Made a few purchases including a very smart Neru jacket for £5 and some old ships brass sundial compasses. Had lunch at a street cafe I had 3rd down on the right and Vic when for safety with a dosa. When it arrived Vic and I tucked in and she agreed it was delicious, then we found she was in fact eating my choice when her somewhat boring dosa arrived. It was like Rob was there in spirit. Wandered back down the hill to the hotel for a much needed beer. Julie was asleep so Rob never knowing turned down a beer joined us. Vic went off to have her feet rubbed and head pummelled while Rob and I took a taxi to the local monkey temple. 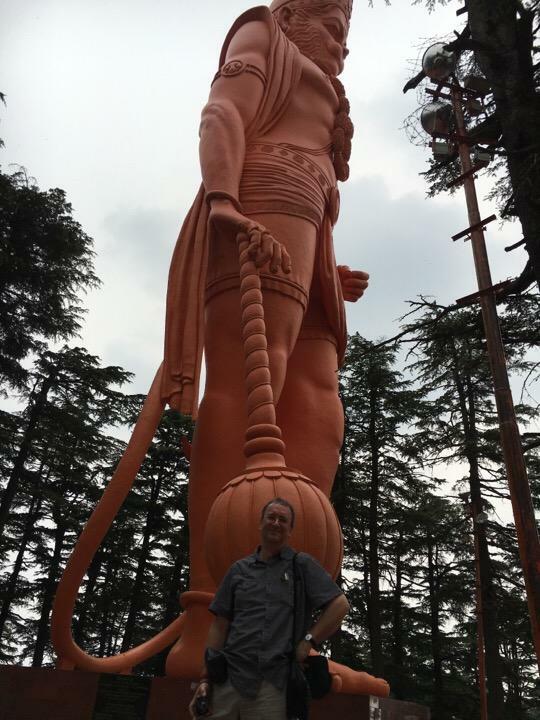 Very interesting drive up the hill with switch backs and three point turns to get round the corners into the temple area and viewed the giant monkey statue before the long walk down the hill and into the hotel for a beer, and meet up with girls. Vic enjoyed her massage and Julie was up and about. Just time for G & T and diner.